Scaffolding collapses at site of new Merseyside Police HQ. Is it just me or do you find yourself driving differently when you spot a police car in your rear view mirror? Your hands slide slowly to the 10 to 2 position, your right foot becomes somehow lighter and the speedometer suddenly registers a speed that is at least 1 mph less than the local speed limit. So imagine how you’d feel if you ran a scaffolding company and you received a call to say that your company’s handiwork had collapsed on a project to create a new headquarters for Merseyside Police. Well that’s precisely what happened last week when parts of a building due to be cleared to make way for the new £45 million Merseyside Police HQ collapsed into the street. Scaffolding and debris from Grosvenor House, on Grosvenor Street behind St Anne Street Police Station, Everton was fenced off after the collapse. No-one was injured in the collapse. 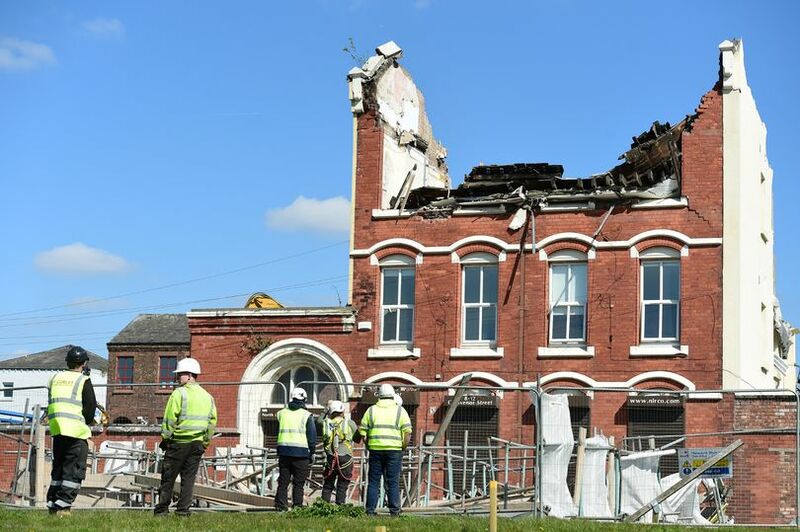 The roof of the building appeared to have collapsed and a scaffolding frame fell away, landing on the roadside. Kirk Scaffolding, the company providing scaffolding to the scheme, confirmed there had been no injuries but refused to comment on the incident. A spokesman for construction firm Wilmott Dixon, which is managing the project, said: “At around 1pm we did have a minor scaffold collapse during demolition works, however no one was injured. Posted: April 16th, 2019 under Accident, General.